Opening Day for 2018 is dependant on course conditions and local weather. We will set an official date as soon as the snow dissipates and can determine the earliest possible day to open. October 31st will be the last day to golf for 2017. The course, clubhouse and pro shop will be closed from November 1st until Spring 2018. We had a great day for our SPGC 2017 Club Championship August 23rd to 26th . Congratulation to all the participants! New stock of apparel, accessories and equipment is arriving each week. We also have a selection of 2016 golf shirts priced to clear. Memberships are available. See the website for details. 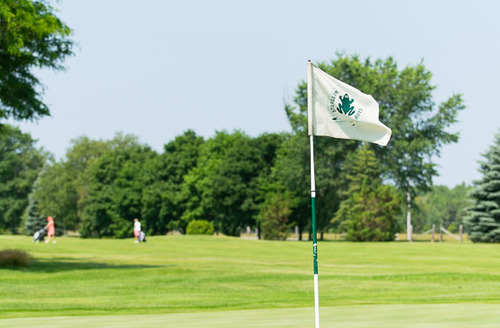 Golf Canada Gold Level Membership is included in all SPGC Memberships. These will be arriving soon. 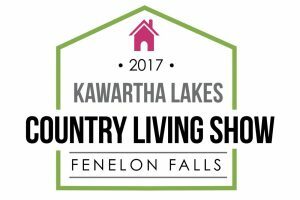 Drop by our Booth #61 at the show. Putt for a chance to win a free round of golf! 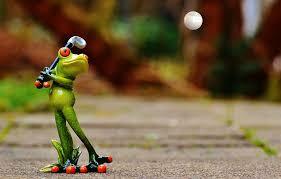 May 3 - Informal Golf "Meet and Greet", foursomes will be made up as golfers arrive to play. Annual Spring Meeting and Potluck lunch will be announced when the date is determined. Watch the notice boards at the club, and also the website calendar. WOW is open to all Women - members and visitors. Sign up in the Pro Shop to play in the WOW group. We acknowledge and thank those who participated on the Executive team last year, and welcome our new Executive members as planning gets underway for 2017. We welcome any suggestions from our members for a successful golf season. Remember...your voice - and participation - counts! The Men's League plays on Friday mornings, sign up in the Pro shop to be included in that week's play. Come out and enjoy a regular schedule of friendly competition with a variety of games. Any and all male members are encouraged to participate. Non members may play with a sponsor for 3 occasions as long as they buy a green fee and put their entry in the pot. This is a special edition of our newsletter from Club Pro, Mike Gascho, featuring: updates on course opening, staff, golf gear, driving range improvements and our booth at the Country Living Show Apr. 28-30. Watch for our regular monthly News Flash coming out next week. Happy Easter everyone! I hope you’re enjoying the long weekend. We are eager to get the course open for you as soon as possible. We’re fortunate to have Tony back this year, and he has been hard at work in anticipation of opening day, which we hope will be Friday April 21st. Of course, that is weather dependent so call the Pro Shop or check the website for updates. We are also thrilled to welcome back Karen Colliss in the Pro Shop. Karen is invaluable and I know you will all be as happy to have her back as I am. I’d like to thank George Welwood for attending to the damage to the fence on #2, sustained over the harsh winter. The eagerness of our board members to attack these kinds of projects is greatly appreciated. New stock will be arriving in the Pro Shop shortly. We’ll be featuring a full line of Srixon and Cleveland products. If there is any gear you want to special order or for advice on equipment purchases, give me a call in the Pro Shop and I will be happy to help get you outfitted for your best game. We did a lot of work on the driving range in the fall, including a new tee deck that will be opening with the golf course. The chipping area will be closed for seeding until the May long weekend. 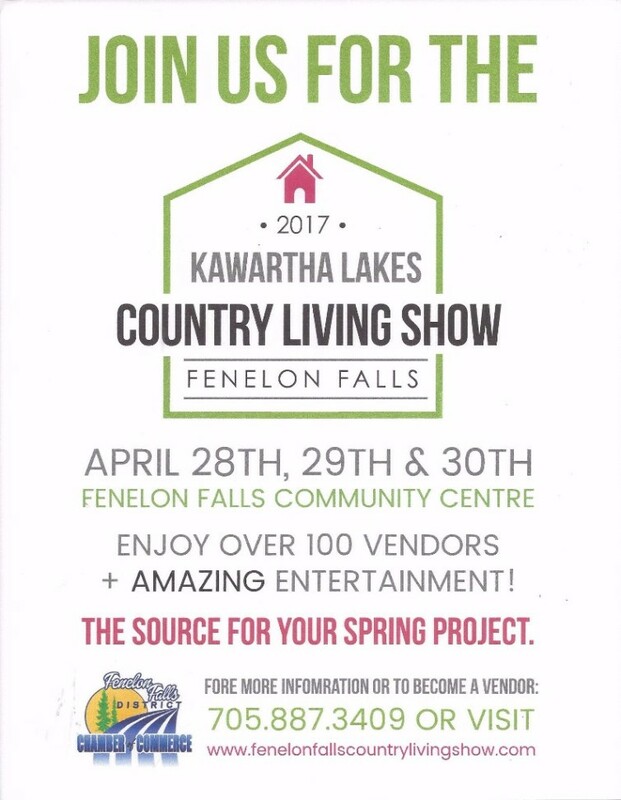 This year we will be participating in the Kawartha Lakes Country Living Show at the Fenelon Falls Arena, April 28th to 30th. With over 100 booths of useful products, services and info, and free admission, it’s sure to be worth a visit. Swing by our booth for your chance to win free guest passes! Our new website is up and running, and we are updating it all the time as new details about the 2017 season are firmed up. This will be a great resource for you so check in often. We are also on Facebook and Twitter so find us online to stay up to date. I look forward to seeing you all out on the course soon. Early-bird membership offer deadline is March 31. For new and returning members who submitted their membership form with 50% of payment, remember your final payment is due March 31. If you have any questions regarding your membership renewal, please call 705-887-3144 for details. Greetings to fellow SPGC members, and visitors. I hope everyone is having a great winter. I’ve been away for a month, but I understand that an early spring might be in the forecast. That turns our thoughts to warm weather, sunshine and golf!! We’re all looking forward to a terrific season this summer. I’d like to take this opportunity to thank Rick Davis and Hugh Graham for their dedication and commitment to the board these past few years. I have the honour of taking over Rick’s role as President. Please feel free to contact me at any time with questions or concerns. Your board of directors is always pleased to receive feedback from members. Your board has been busy over the winter getting things ready for this year’s golf season. First, I’d like to confirm that both Mike and Tony will be back at the course this year. 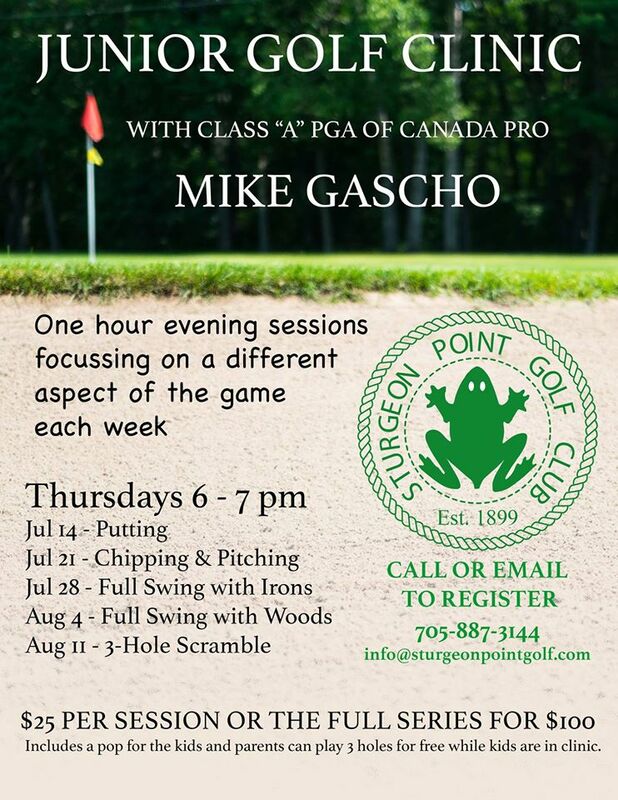 Mike will be working on enhancing our Junior Golf Program and organizing more clinics throughout the summer. With the funds raised from the 2016 SPGC Classic, improvements were made to the driving range last fall to accommodate the growing junior program and improve the conditions for our members. Please spread the word about our junior golf and the clinics. The future success of our club depends on increasing membership and encouraging young ones to take up the sport! I’d also like to thank the many volunteers that came out last summer and fall to help with the maintenance and upkeep of the course. This year we are launching a new program whereby various groups of members can take “ownership” of a hole. This will include picking up tees, filling divots, weeding gardens etc. Please think about forming a group and getting involved in this worthwhile endeavour. Kim Colliss will be spearheading this venture and there will be more details available over the next couple of months. I’m also very excited to announce that the Second Annual Sturgeon Point Golf Classic will take place this summer. The feedback from last year’s event was so positive that the planning has begun for this year. So if you’re looking for an afternoon and evening of great golf, prizes, dinner and dancing, we hope to see you there!! Chris Van Lierop will once again be leading this and we’ll be looking for volunteers to assist. As soon as we confirm the date we’ll forward the information. On behalf of the board of directors, thank you to all of our members for your continued support of Sturgeon Point Golf Club. Remember that we are always looking for new members, so please encourage others to join. We have an amazing course and we should all be very proud when welcoming new or returning golfers to the club! Inaugural SPGC Classic a hit! Details for Junior and Ladies Clinics in this issue. Stay up to date - Like us on Facebook! We would like to thank all those who participated in our first annual “Sturgeon Point Golf Classic” on July 9th. A great time was had by all! From the golf to the food to the dance, every aspect was top notch and sets the bar high for next year’s Classic! Feedback has been extremely positive and we hope to build on this success for next year. Also we would like to thank all those who donated to the cause. The money raised will go towards enhancing our junior golf program and truly make our club a “premium” destination for junior golfers and their families! I’d like to extend a huge thanks to all the organizers, volunteers and participants of the Inaugural Sturgeon Point Classic. It was a fabulous event! We started our evening Junior Clinic on July 14th with a great group of kids. There are still 3 Thursday evenings left in the series and kids are welcome to sign up for the remaining sessions. We also wrapped up our second Junior Camp. The July 25-29 session is sold out but there are a very limited number of spaces available for August 15-19. Ladies Clinics will be starting on July 25th and ending on August 22nd. $25 per session or $90 for the full series. 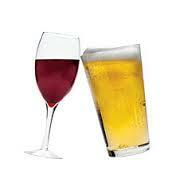 Includes a beer or glass of wine, with lots of fun and coaching. On June 22nd the ladies from WOW hosted their annual “Breast Cancer Fundraiser Golf Tournament”. It was a great day and raised $2,160 for a great cause! Our Women on Wednesday league is in full swing as we continue to grow our membership. Welcome to all those newcomers! I’m thrilled to welcome Tasha Bullock to the Pro Shop this season. Her past experience and positive attitude will be a great addition to our team. 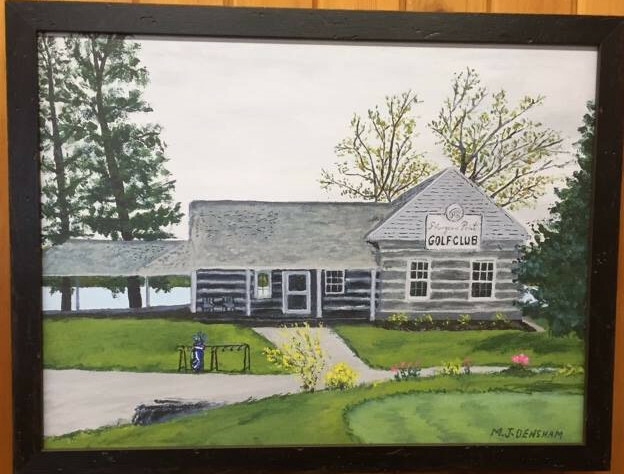 Mel Densham has created a beautiful painting of the clubhouse and has generously donated one print to the club, as well as one for the Sturgeon Point Classic Gala. He is selling limited edition prints in the Pro Shop. $145 framed or $99 unframed. We kicked off the Golf In Schools program last month with a school visit to Lady McKenzie Public School in Kirkfield. I’ll be visiting Langton Public School in Fenelon this week. We’ll be hosting the students at SPGC on June 13th and 20th to introduce them to our course and the game. This initiative is the first step in developing our Junior Program to reach out to new young members. Our Junior Golf Camp starts in July with the first session already sold out! Spaces are still available for kids aged 8 to 12 in subsequent weeks through July and August. The cost is $195 (tax included). Golf Camp kids are eligible for an optional Junior Membership for just $99. Men's, Ladies' and Teen Clinics will be starting up soon. Sign-up sheets will be going up in the Pro Shop to gauge interest so keep your eyes peeled. SPGC is on FaceBook! 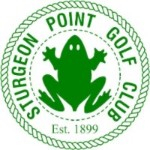 Like our page at https://www.facebook.com/sturgeonpointgolf/ to stay up to date on club news and events. 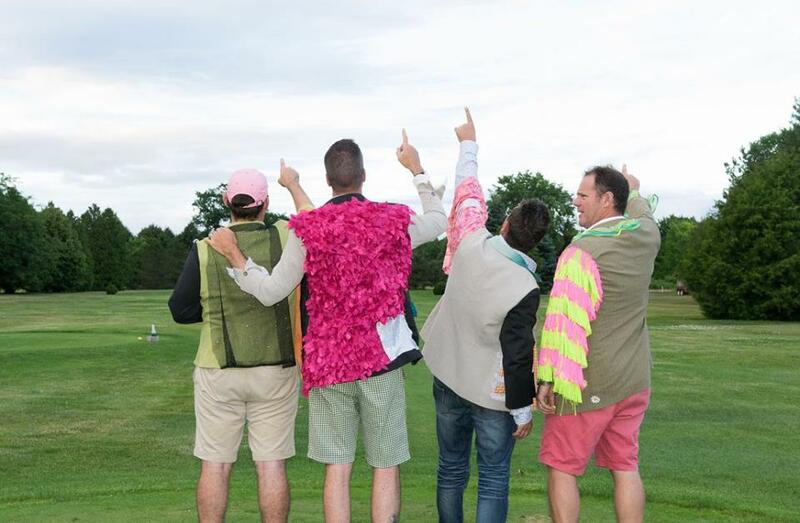 We are holding our annual “Breast Cancer Fund Raiser – Golf Tournament” on June 22nd. We have been participating for 10 years and through all of our efforts we can help support the diagnosis and treatment of many people in the City of Kawartha Lakes. To participate, please contact the Pro Shop or Jacquie Graham (705) 887-3258 or Pam Whitman (705) 887-3369. Turnout so far has been limited to a small, but consistent group of about 35 individuals. As the season moves forward and the weather improves there is likely to be more interest. Prizewinners have been many and varied due to the different games and team selections. Many thanks to the volunteer men who consistently set up and run these games. Welcome all members! Saturday, June 11th @ 5 p.m.
Join us for a special thank you to Mary Gascho! Saturday, July 9th @ 2 p.m.
Saturday, Aug. 20th @ 9 a.m.
We would like to thank all of the members who came out to assist in the spring clean up; Bob Austin, Bob Miller, Kim Colliss, George Welwood, Hugh Graham, Paul Wilson, Howard Garrie, Sam Fox and Roger Beaven. Thank you also to the staff for an amazing job in getting ready for this year’s golf season. There was a lot of skunk damage on the course and winter rules should apply until these areas are playable. Another arbour day is planned for the dock area. Watch for the date as we’ll need volunteers. 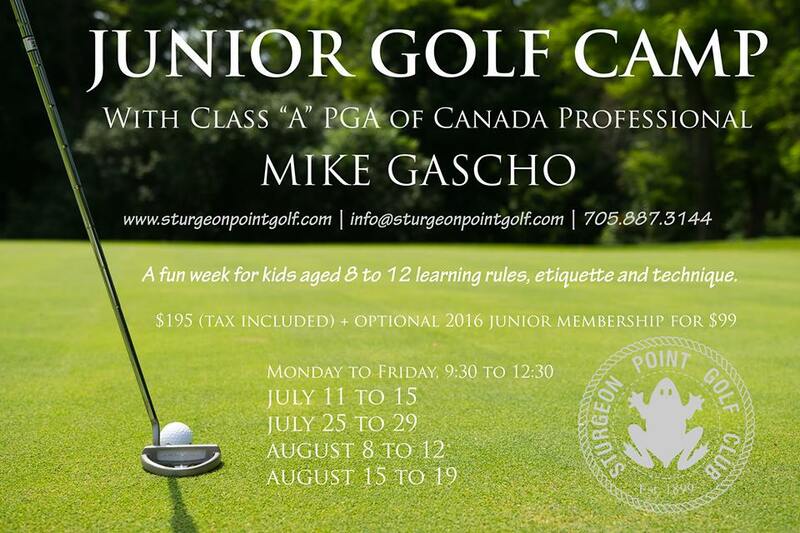 Please support our upcoming junior golf program and buy a ticket to the 1st Annual Sturgeon Point Classic. volunteers that helped with the course cleanup prior to opening. Your efforts are greatly appreciated. Tony and his staff have the golf course in wonderful shape despite the recurring late-night visitors searching for grubs in the rough. The damage will take time to fix while we wait for rain to help with re-growing the affected areas. We are proud to be contributing to the Golf in Schools program this year by sponsoring Langton Public School and Lady McKenzie Public School, which will introduce 150 kids to our junior program. I will be making a school visit as well as bringing the students to SPGC for a course visit and onsite golf lesson. 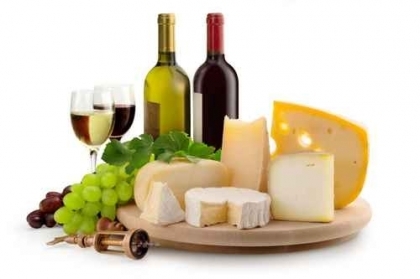 Our Wine & Cheese to be held on Saturday June 11th at 5 pm. We need to have an idea of numbers so let us know if you plan to attend. Sign in for your free Golf Canada Bronze Membership, and ask us about upgrading to a Gold Membership. 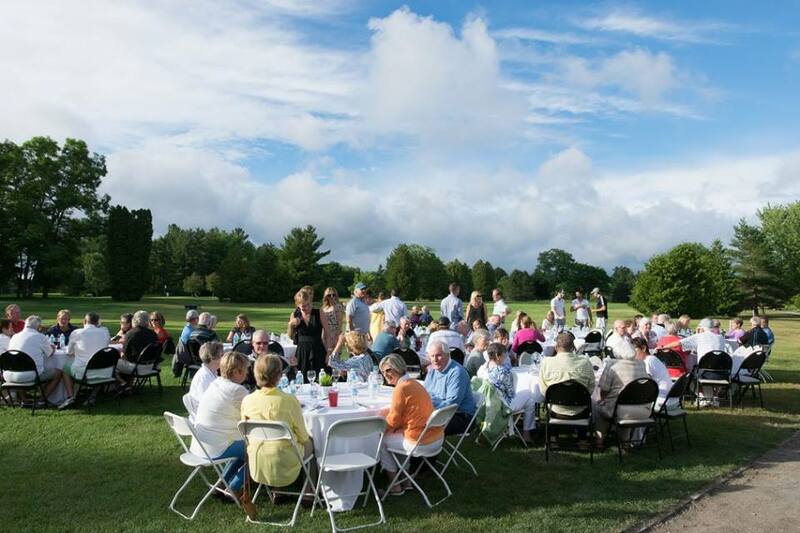 Please mark Wed. June 22 on your calendar and sign up for the Charity Event (formerly named Member-Guest Day) hosted by the Women on Wednesdays at SPGC. Men and women golfers are welcome. Bring your friends! We are also looking for volunteers, with net proceeds going to the Breast Health Diagnostic and Care program at Ross Memorial. Regular men’s Fridays have begun and all male members are invited to sign up before every Thursday to be included. Tee times are set by Thursday morning and sent out via email. A variety of games are played as well as an optional closest to the pin prize. Remember all male members are eligible as well as a guest at a reduced green fee rate.